Last summer, the African Perspective Magazine met up with one of the biggest music artists in Africa and an East African Legend "Bebe Cool" during his Canadian tour. Real name Moses Ssali, a.k.a big Size, Extra Large, Titanic, Mr. Showbiz, Big is Big, Munene Munene is a house hold artist with numerous HITS such as Agenze, Boom Bark Bogolako, Kasepiki, Ceaze and Sekkle, Dogolyo Sanyu Lya Mutima Gwange, Ntuyo Zange and more and more.. 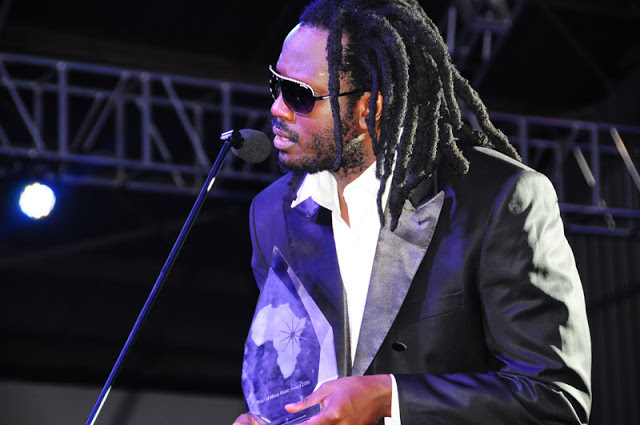 Throughout his long career, Bebe Cool has been nominated and won a number of awards both local and international. This awards include the PAM awards, MTV, Mobos, Kisima, and Koras Awards. He notes that his biggest concert yet was the 46664 Mandela concert in Hyde Park London. The man is also a 46664 ambassador. Bebe Cool is also a man of unique character. He does not mince his words one bit. Thus, his political, social and philanthropic views are both sound and worth sharing. BEBE; Most people know me as Bebe Cool the singer, but my real name is Moses Ssali. Ugandan born and I've been doing Music for the past 20 years. I went to school in Uganda till form six, after which it was just my decision to become a singer because half of the time in school I was pretty much doing Music. TAP; How exactly did you get into music or did music just come to you? BEBE; Hmm music didn't come to me, in my time, it wasn't there in Uganda but for a small scale, so i saw an opportunity to become the biggest music maker in East Africa especially since technology was catching up and i took it. It also helped that i had good brains to interpret what the teachers were teaching us at school regarding our future and success. For example, one time our Physics teacher said something that got stuck with me, he said that "it was so important for someone to be self employed". After that, I became very keen as i didn't like waking up every morning and being told what to do. I knew that if I was going to be that stubborn, I had to be my own boss. Hence, I went to see this teacher after school one day and i asked him what he meant by "self employed"!! His answer was that "if you have talent, then your self employed". From that day on, I made the switch and got into music full time. In those days, it was not easy being accepted, you had to prove to people that you can do something better. Also, it wasn't just about putting food in your mouth, you had to carry the flag for the country. Things have now changed from those hard days, I've now travelled countries, I've done concerts, my biggest one being the Mandela concert at Hyde park London. I've made singers, I've made friends, I've made enemies but all these things come with the big package called success. That said, its my first time in Canada and i feel like its the beginning, I've been putting up roots and i feel that the flowers are starting to fall now; even though I'm a veteran. "I have hundreds of songs but no albums. I count no songs anymore, if i can't sale CD's because of piracy, then why make albums? I release music every week, i flood the market"
BEBE; Yes, I was in Kenya in 1997 and yes I'm one of the old guard. Actually, I'm the first ever Ogopa Dj's artist. I came in first, then Redsun, Chameleone, then the late E-Sir, Nameless, Nonini and others. TAP; You mean you'll be working on a hit song or an Album? BEBE; Yea, there's an Album that will be out for the bashment crew. East African reggae fans should be excited. TAP; Your also working with the East African Bashment Crew, whats the deal with that? BEBE; Well EABC is Bebe Cool, Nazizi and Wyre, a group of artists who are all strong individually but who thought that if we need some togetherness to break new boundaries, that we would make the right combination. We are still the right combination. Right now though, we haven't done anything as Bashment for two years because our individual projects are doing well, the three of us. Also, my counterparts have had babies of late so they have turned into family people and needed a little break here and there but i think by the end of this year there will be more projects because there's more walls that we need to break; internationally, for East Africa we good to go. TAP; Great news. Now tell us, you've been in the game for 20 years and you don't seem like your going to stop! What's pushing you? I mean, on the ground, who is cooking? BEBE; Hahah, I'm not going to stop. Basically, i cook, I can't really say that someone else is cooking because my rule is to make friends. If you make 10 friends you don't lose one. Its these friends that I've been making since my days in Kenya and in Uganda before that keep spreading my name and making my name bigger everywhere around the world. This is how you last long in this business and thats the way i run my business. I haven't lost a single friend in my business environment all these years because i know if i lose one friend, I've lost 10 fans. I respect my business and I respect my people in the business industry. TAP; Right now Uganda is booming with new music and musicians. In fact, there's a new hit everyday! what's happening, how are you guys doing it? "If we go another 20 years like that, Uganda is going to have the best music industry ever to exist in Africa". BEBE; Well, typically, there's a lot of competition and I credit Uganda because even six years ago Uganda wasen't in the top six in Africa and now i can rate it to be second. South Africa has taken the third and Nigeria comes first at the moment because of numbers, not that they are that better than us! With all this passionate competition, we are trying to keep it to just positive competition and to avoid negative competition, to try keep it at a level where guns cannot apply!! Otherwise, that kind of crush that we have that i call competition has kept a lot of people on their toes in Uganda and in East Africa. It has kept the press attentive, it has kept government paying attention because governments know that when we talk, people listen. At the minute, the whole of the East African community is paying full attention because of these crushes. Actually, its not just East Africa because what is going on in Uganda is now on youtube and websites and a lot of people who live in Canada, US, Europe are following. Take it or leave it, you must pay attention; so we created something, personally i know i did and maybe Chameleone and lastly Bobby Wine that you wouldn't miss. Now the music scene is so tight that you don't sleep, I'm now in Canada for only three weeks but i know little boys are cooking to shoot on me, you get on the concert and when you get back all of a sudden there's a new song and the people are like "that guy is burning fire, what are you doing, sleeping"?? I think if we go another 20 years like that, Uganda is going to have the best music industry in Africa ever to exist! Why, the people have accepted, if you give them quality, they will pay for it any figure, if you give them quantity but no quality, you'll never get anywhere. TAP; As a veteran of 20 years in the industry, what is your advice to the up and coming artists both at home and in the diaspora? Give us two things that tops them all. BEBE; The main two things is one, trust in God. Two, always have a plan, focus and always have a goal at the end. Plan, focus and goal are one. You have to know the end point, what you want to achieve, then make a plan for it, in that way, any artist can be made. You also have to be patient, its not just making money, you have to be patient, people take time to like people. Its also important to respect the industry, no drugs and things like that. TAP; Where can people legally get your music? Is Bebe Cool on iTunes? BEBE; I won't tell you I'm on iTunes and even if you see my name there, whoever is selling my music is not paying me. Why, because the industry back home we haven't really looked at selling our music that way! We earn money through concerts. Piracy is 100% and if you try to fight it, your music won't move. If i don't let you burn my music, then you won't know my music here in the diaspora! That means i won't be able to come do no gig!! We do have a lot of problems back in Africa in general. Nonetheless, as time goes by, maybe in East Africa we will look at the issue of piracy as one, because theres no way you'll control it in Uganda and its not controlled in Kenya. And you can't control it in Uganda and Kenya if its not controlled in Tanzania! We need to control piracy as a region, then slowly, whoever has done songs a 100 years ago can get paid. Once piracy is controlled, even the late Philip Obongo will get paid, the rightful owners of property called music and music writers will/their kids and grandkids will get paid. What i see at the moment is climbing a tree from the the roots, not the leafs, i mean, these countries, China, USA, Canada, they all came from the bottom; slowly by slowly we will catch up. TAP; Does that mean your not making any albums anytime soon? BEBE; Well i have hundreds of songs but no albums. I count no songs anymore, if i can't sale CD's because of piracy, then why make albums? I release music every week, i flood the market, i just do songs. If you talk about performance for hours, yes i can go from 9 to 12 hours. Thus, we're talking about an artist who doesn't know what an album means because of piracy back home. TAP; Music aside, what are some of the situations facing the youths back home, In Kampala? BEBE; Youths in Kampala have the same issues as those in most of other places, they have issues that deal with politics, systems of governments and in Uganda of course the youths are pushing the present government to make some reforms. They are fighting for what the youths should be enjoying! Funding from the government, university fairs, welfare and many other things. TAP; Since your a big and a respected individual in Uganda, how are you trying to aid the youths? Where you grew up, are you in someway involved with the youths in that community? BEBE; Yes, a 100%. I do a lot of projects to give back in general and not just to the youths. I do a lot of cancer projects, school fees projects, i do a lot of concerts for sick kids. Last year i did a cancer concert and this year I'm doing a kidney concert. I do all this as an individual artist just to show people how to give back to the community. Otherwise, it would just be fetching money from the community and not giving anything back. TAP; So should we expect a Bebe Cool centre in the next few years? BEBE; Oh Yes, there's one already. I've got a charity centre in Kamoli, past Ginja. I met this white guy who wanted to give up on an initiative he had started and i told him not to give up and ill help him, so we started a project together. TAP; I know your a father so lets talk fatherhood. How do you manage to be Bebe Cool and also stay a dad at home? BEBE; Well, I'm fortunate to be a father and i always try to give my kids time. I believe that I'm lucky, my mom brought me up well so its time for me to extend that to my little ones. No matter what situation your in, you've got to be a man, do the right thing and keep on going. If your a man, your a man, you've got to be a man. TAP; Now let's talk a bit of politics, rumour has it that you play golf with "SEVO", squash that rumour or keep it real?? BEBE; Hahahah, well for sure his my personal friend. We share the same political ideas, individual ideas and not the system. You see, his the president, he doesn't run the whole system, he delegates people and most of them go and do so many wrong things. I like his ideas, I've been around him one on one and i like him as a person, not the system, but him as a person. TAP; So whats your opinion of Ugandan politics at the moment, do you thing the country needs some changes? BEBE; Definitely, the country needs some changes. He has done a great job, he has done the best job he can but so many people have let him down. So it appears to the normal people that its him who is letting the country down, yet its these people that he has delegated work too; they want him to look bad. You know you can be Obama but you won't run all the corners of the US individually, you can be the Queen but you won't run all the corners; especially in Africa. This is a country that's been through wars, it has seen a lot of trouble, hand it to one guy to manage and its not easy. Its hard to run. You see Kigali, its under the arm of metal, they say you do this and its a must. Yes, people need their rights, but i think its okay that people have decided to sacrifice their rights in Kigali for the better of the whole country. If Ugandans can also do that, things could be better but for me I'm okay with the change because new people will mean new ideas which is better for any nation. Either way, he has done a great job, for any country security is very important, for any country, infrastructure is very important and for every country communication is critical and he has delivered on that. TAP; Second last question, tell us about July 11 2011 and how that experience has changed your perspective, views? BEBE; Oh, thats the bomb day right!! Basically, that was such a bad day for me, i was with a lot of fans and i saw a lot of people dying. I believe it doesn't matter who you are or what country you come from, we all have to fight terrorism. If many people face that, believe me they will hate a lot of things in life, you actually come to hate yourself when you see so many people die just like that, a lot of innocent people. Now, I don't want anything to do with terrorism, drugs and depression. I don't want to see people depressed because thats why they end up doing so much harm to others. TAP; Final question, Its hard this days to talk to a Ugandan and not ask about Kony because people recently learned through a youtube video that there's a guy in Uganda that killing people! whats your take on Kony2012? BEBE; Hahah, Well i live in Uganda and of course I've heard about him but I've never came close to him. I've passed through the roads and forrest near where he was fighting during those times but people like I get protected because we are passing through. I know that he does exist but he no longer lives in Uganda, his maybe in the Congo forest or South Sudan but his not in Uganda. He keeps flashing in and out but his definitely not in Uganda. I think the job being done by Uganda and other people who are helping fight him has been a good one. He was in Uganda for a long time, he has killed a lot of people and that's why all of us in Uganda and all the people who are pro-Uganda are against Kony and I'm personally very happy that his no longer killing people in Uganda. TAP; So in a nutshell, Kony is no longer killing people in Uganda and people should not be mentioning Kony and Uganda simultaneously. BEBE; No no no, they should not. They haven't got him, but at least the people are no longer suffering in Uganda. "I believe it doesn't matter who you are or what country you come from, we all have to fight terrorism. If many people face that, believe me they will hate a lot of things in life, you actually come to hate yourself when you see so many people die just like that, a lot of innocent people".